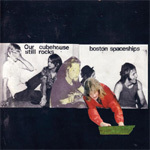 Following three full-length records in only two years, Our Cubehouse Still Rocks is a breakthrough fourth from supergroup Boston Spaceships. Featuring Robert Pollard (Guided By Voices), Chris Slusarenko (Guided By Voices) and John Moen (Decemberists), the band began as a long-distance recording collaboration, but brilliantly hits their stride on this album as an unshakable, actualized band. For a group that took their name from the over-the-top UFO illustrations on record covers from 70's arena rockers Boston, there's no denying a classic-rock flag flying high overhead. Just below, however, there's a bustling churn of art-damaged new wave, echoes of Devo, mid-period Wire and the sour songcraft of the Rough Trade stable. From the lead-off near-prog sunshine psyche of "Track Star" to the barn-burning album closer "In The Bathroom", the 16 songs fly by in gust of demented high-energy pop. Pollard's visual arts talents, especially his fascination with collage, seems to have integrated themselves into the sonic realm more with Boston Spaceships. While early GBV had the occasional tape cut-up, on this album compositional collage runs through the songwriting, be it schizophrenic structure or a completely random burst of overdubbed drum solos. Bouncing from acoustic psyche dirges to beer-soaked rock and roll, the record is brimming over with hooks and Pollard's incredible gift for melodies so catchy they shine through even the weirdest musical surroundings. Easily the best collection of songs from the Spaceships, some of their strongest tunes meet up with expertly-produced sonic landscapes. More than anything on this record Pollard sounds rejuvenated and excited. At this point, literally thousands of songs into a decades-long career, that kind of unprecedented prolific output could result in a few phoned-in numbers. But once again this is not the case. Our Cubehouse Still Rocks is the sound of a band alive with the energy and excitement of making a brand new incredible noise. Every second feels electric. Original release date was going to be 5/25/2010 but changed to 9/7/2010. Additional Album Text Everything It's The Boy!